Waterford’s Jack O’Donoghue starts at open-side flanker for Munster in Edinburgh tomorrow. Photo: Inpho. 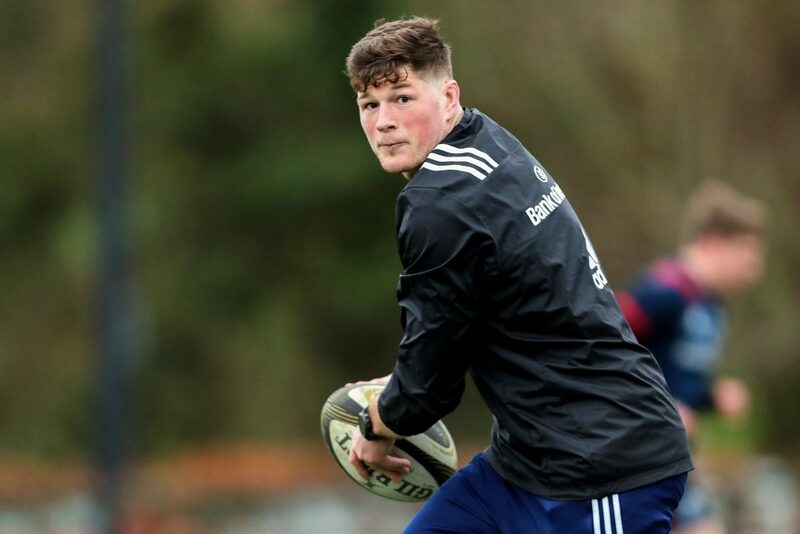 Woodstown’s Jack O’Donoghue, who made his first start of the season last weekend against Zebre, will make his first Champions Cup start of the season tomorrow (Saturday) as Munster face Edinburgh in the province’s record 18th Champions Cup quarter-final at Murrayfield at 12.45pm. The open-side flanker only returned to the Munster squad a month ago after being out with a knee injury since the Pro14 semi-final against Leinster last May. Munster Head Coach Johann van Graan has made 11 changes to the team that defeated Zebre in the Guinness PRO14 last weekend. Peter O’Mahony returns to captain the side from the number six shirt and he joins O’Donoghue and Stander in the back-row. Joey Carbery has recovered from a hamstring injury and returns to the backline along with Andrew Conway, Chris Farrell, Keith Earls and Conor Murray. The six changes in the pack see Dave Kilcoyne, Niall Scannell and John Ryan pack down in the front row with locks Jean Kleyn and Tadhg Beirne also returning alongside flanker O’Mahony. Mike Haley starts at full-back with Conway and Earls on either flank. Rory Scannell is joined by Farrell in the centres with Murray and Carbery in the half-backs. MUNSTER: Mike Haley; Andrew Conway, Chris Farrell, Rory Scannell, Keith Earls; Joey Carbery, Conor Murray; Dave Kilcoyne, Niall Scannell, John Ryan; Jean Kleyn, Tadhg Beirne; Peter O’Mahony (C), Jack O’Donoghue, CJ Stander. 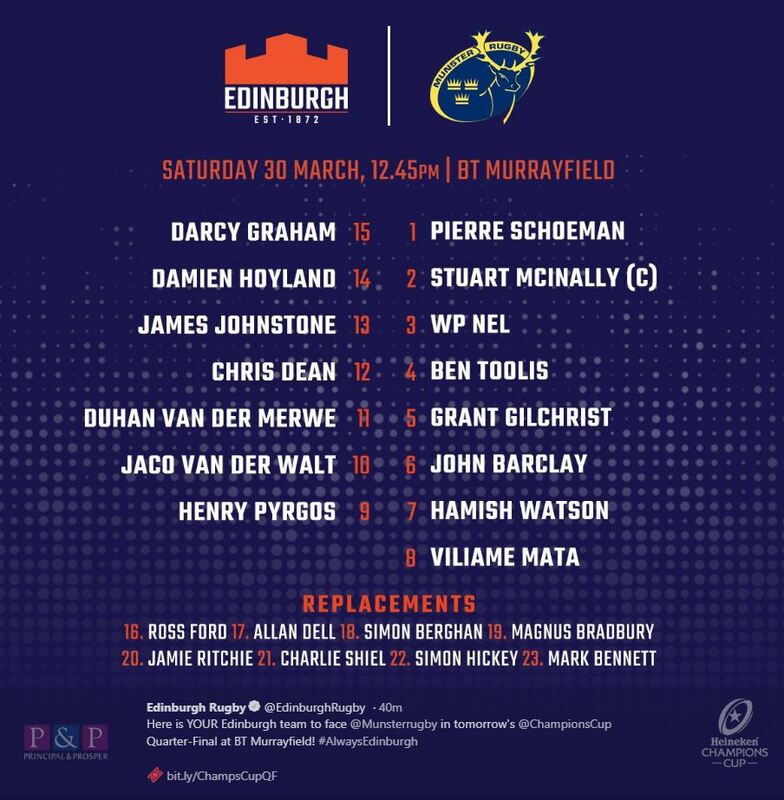 Below is the Edinburgh team for tomorrow’s game.